Join us in the beautiful Airbnb theatre for an evening of FUN empowering women to travel solo and live their best life through adventure! Hear from travel influencers and find the right type of vacation to fit your solo travel style. Discover tricks and tips on getting the best flights deals and accommodations. You will also learn ways to keep safe when wandering alone and get access to awesome sample itineraries. As always well have great food, drinks, games, and awesome prizes! Danielle D. Washington is the CEO and founder of Rogue Experiences, a thriving travel concierge that teaches busy women of color how to ditch the norm and discover the lives they’re meant to lead, via unforgettable travel experiences. With over 20 years of experience in event planning, logistics, and hospitality, Danielle is skilled in curating one-of-a-kind, domestic and international excursions for group and solo travelers. She proudly offers a variety of services that include destination research, flight and accommodation research and booking, and detailed trip itineraries. Her main priority is helping her clients use travel as a way to live life on their own terms and immerse themselves in the freedom that comes along with that. Stacy Griner is an Integrative Health and Wellness Coach who is passionate about helping people integrate holistic wellness practices into their daily lives. Stacy became an Ironman triathlete in 2016 and raised thousands of dollars for San Francisco AIDS Foundation by completing the AIDS\LifeCycle 7-day, 545 bike ride from San Francisco to Los Angeles in both 2014 and 2016 and plans to participate again in 2019. She has traveled to over 22 states and 17 countries. She has traveled solo to Vancouver, Guatemala, Belize, Madrid, Barcelona, and Morocco. Travel is her therapy. Cheers to those of us who struggle passionately, and intelligently to BE our best but don't always FEEL our best. When we hear "self care" we usually think spa days, scenic walks, or just chillin' [which is cool] but there is a deeper level that we aim to explore at this empowering event. Join us at Wework Gas Towers in DTLA as we empower ourselves to prioritize self care on a deeper level through emotional wellness. Emotional wellness involves being attentive to your thoughts, feelings, and behaviors, whether positive or negative. It implies the ability to be aware of and accept our feelings, rather than deny them, have an optimistic approach to life, and enjoy life despite its occasional disappointments and frustrations. Cant make it to this event but want to keep up on future events? Join our mailing list at www.gyalsnetwork.com. Follow us on Instagram, facebook, LinkedIn, and Twitter. Note: If you are interested in our Los Angeles Emotional Wellness event, click here. The event below takes place in San Francisco. Join us at Square Headquarters in SF as we empower ourselves to prioritize self care on a deeper level through emotional wellness. Emotional wellness involves being attentive to your thoughts, feelings, and behaviors, whether positive or negative. It implies the ability to be aware of and accept our feelings, rather than deny them, have an optimistic approach to life, and enjoy life despite its occasional disappointments and frustrations. By popular demand we are offering a special in-person Salary Negotiations workshop with the amazing Kathlyn Hart who has designed a highly rated program aimed at empowering women and people of color (all genders welcome) who have been statistically shown to be paid significantly less than their white male counterparts on average. Please check out a feature of our last program in Black Enterprise here. Join us on September 12th, at 6:30PM at Wework SOMA to learn the core skills/techniques required to successfully negotiate a job offer, including how to respond when you are asked "what is your current salary?" Be sure to take advantage of limited early bird pricing. Kathlyn Hart is a salary negotiation coach and a motivational speaker who supports ambitious women to dream big, live bold and earn more. Through her salary negotiation bootcamp “Be Brave Get Paid,” which has helped women increase their income by an average of $15,000, she teaches underpaid women how to confidently own their worth and ask for more. Kathlyn’s teachings on career, courage, and business have been featured in publications such as Business Insider, Forbes, Bustle, The Muse, Learnvest, Hello Giggles, and Popsugar. She lives in San Francisco, California with her fiance and puppy Bernie. There is likely to be an entirely new generation of billionaires in the making as blockchain and cryptocurrency technology takes hold in the mainstream, as well as quite a few multi-millionaires amongst the "early adopters" still getting in now. Unfortunately, many of the same structural problems that plague traditional finance are already emerging in cryptocurrency, where women make up less than 4% of total investors. Blockchain and cryptocurrency: What is it? Cryptocurrency: Is it safe? How is it real? How does it have value? How are institutions investing in blockchain and cryptocurrency? How do I get involved? Is too late to invest? How to get a career in blockchain/cryptocurrency? Casey Caruso, Partner Technology Manager at Google:Casey Caruso is a blockchain investor and engineer who originally got involved in crypto as a miner. Casey organizes the San Francisco BlockchainMeetup@Google and works as a Partner Technology Manager on Google Search. Caseystarted her career conducting research at Johns Hopkins Applied Physics lab, while pursuing her M.S. in Computer Science, and went on to start Bakround, a SaaS company in the machine learning space. Most recently, Casey moved to the Bay Area to follow her interests in blockchain and evolutionary technology. Rhiannon Payne, CEO of Sea Foam Media: Rhiannon specializes blockchain consulting, whitepaper creation, and marketing. She launched Sea Foam Media after identifying a need for companies to better manage their data curation and annotation work. ICOs (Initial Coin Offerings) and DApp (Decentralized Application) projects, have quickly become Sea Foam Media’s core focus. Marquesa Finch, Health Lead of Silicon Valley Blockchain Society: Marquesa is Co-Founder and Managing Partner at P2Health Ventures, a startup ecosystem and fund supporting entrepreneurs building public health tech solutions. She is also a founding member of the Silicon Valley Blockchain Society where she leads their blockchain health initiatives and is an active thought leader in leveraging blockchain technology to improve equity and access. Previously, Marquesa worked on improving diversity and inclusion in tech through entrepreneurship at the Kapor Center for Social Impact and at the American Near East Refugee Aid (ANERA), disseminated global health interventions in the Palestinian West Bank. Danny Brown Wolf, Head of Marketing at Orbs: Orbs is a public blockchain acting as the production layer to complement Ethereum. Adopting Orbs alongside Ethereum allows dApps to enjoy the best of both chains: unmatched security, liquidity and ecosystem integration, together with low-fees, production-ready scalability and a suitable fee structure. This combination of Ethereum + Orbs is the optimal solution for applications with millions of users looking to adopt blockchain, today. Note: While this event is being led by women, all are welcome to attend. Space for this event is provided by Wework. Gyal's Network is excited to volunteer with Project Open Hand SF the 2nd Tuesday of every month from 5:30 - 7:30 p.m. Join us for one or a few shifts! We always have a great time. Dating and Relationships then and now. How has our beliefs changed? What social and/or environmental factors influence current dating and relationships? Communication. Why it’s essential to a successful relationship. Click here to see photos from our last San Francisco event. Click here to see photos from our San Francisco event. · Blockchain and cryptocurrency: What is it? · Cryptocurrency: Is it safe? How is it real? How does it have value? · How are institutions investing in blockchain and cryptocurrency? · How do I get involved? Is too late to invest? · How to get a career in blockchain/cryptocurrency? There is likely to be an entirely new generation of wealth in the making as blockchain technology takes hold in the mainstream, as well as quite a few wealthy amongst the "early adopters" still getting in now. Unfortunately, many of the same structural problems that plague traditional finance are already emerging in blockchain, where women make up less than 4% of total investors. Is digital currency safe? How is it real? How does it have value? How are institutions investing in blockchain? How do I get involved? Is too late? How to get a career in the blockchain space? How are institutions investing blockchain and cryptocurrency? How to get a career in blockchain/cryprocurrency? Join us for our 6th annual event to celebrate National Women's History Month!! This is a fun time for women's groups in the Bay Area to come together, let their hair down and celebrate. Meet and mingle with some great women who deeply believe in creating a culture of women helping women. We are proud to keep this annual event going for the SIXTH year in a row! This event is for people who identify as women only. An intimate conversation series hosted by Gyals Network. Join us for an evening of radical self-love to answer the question: "How do you practice radical self-love and what do you hope to learn from others?" This talk is inspired by the book, "The Body is not an Apology Movement" by Sonya Renee Taylor. She gave an inspiring talk at TEDxMarin back in October and her new book is set to release later next week. A friend first introduced to her SpokenWord over 5 years ago and found her strength and confidence inspiring. Sonya has continued to travel the global and give powerful performances like this one on SnapJudgement. Now there is a movement and a following. By finding our own inner strength we can then go on to do bigger work in our community. This talk will be help in San Francisco. Exact location details will be sent before the event. 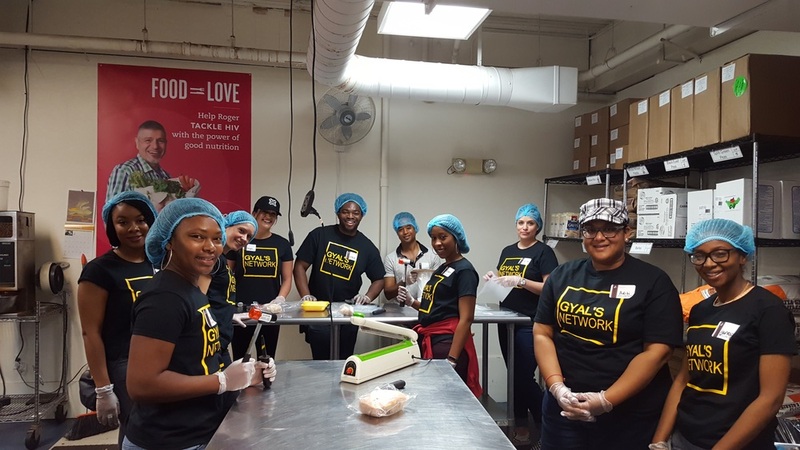 The Gyal's Network is excited to volunteer with Project Open Hand SF on Wednesday, November 8 from 5:30 - 7:30 p.m. We still have space left and need your help! Project Open Hand’s mission is to nourish and engage our community by providing meals with love to the sick and the elderly. A Self Care Workshop for a More Powerful You! **Your registration includes delicious, healthy eats and drinks. We all want to reach our goals. But are we starting with ourselves? How do we bridge the gap between personal wellness and reaching our goals? Join us July 19th, 6PM at the AdRoll headquarters in SF to learn ways to nourish and resource yourself amongst a chaotic world and discover how doing so allows you to be more powerful in achieving your goals. In this workshop we will explore the topics of boundaries, self care through mindfulness practices. Come nourish yourself and engage in juicy conversations amongst like minded, diverse women. This event will be capped at 25 registrations to ensure an intimate environment for healing. Tickets will sell out so grab yours today. Join us for our annual event to celebrate National Women's History Month! With all that's going on in the world, take a moment to relax, meet incredible women and celebrate YOU. Tickets include 1 drink ticket! Wine for Womens Empowerent Month! Experience live mini yoga and meditation sessions lead by experts and connect with amazing professionals while you get inspired to live a more balanced life. Get inspired to lead your life in wellness by our keynote speaker Maya Johansson, CEO of Well Clinic of SF. Also hear from other amazing sponsors and vendors (see below). Come early to participate in the vendor passport game for a chance to win great prizes during our raffle. Wine and delicious Hors d'oeuvres will be served. Gyals Network and Raphael House Volunteering Event! We are excited to volunteer with Raphael House on November 16th, 6PM-8PM in SF. We still have space left and need your help. Sign up here! Raphael House’s mission is to help at-risk families achieve stable housing and financial independence while strengthening family bonds and personal dignity. Gyals gettin' fit together! Join us on Thursday, November 10th at 6:30PM and get fit with other awesome growth-focused women in the bay. First we'll meet at Wheel House in Embarcadero Center, then we'll grab some delicious grub at Sens around the way. Important note: We are not affiliated with Wheel House in any way. The cost for their class is $15 for new clients. Quick registration here. Volunteer with us at Project Open Hand July 23rd! We are excited to volunteer with Project Open Hand on July 23rd, 11AM-4PM in SF. We still have space left and need your help. Sign up here! Gyals Network will host a special free screening of the groundbreaking documentary film, True Cost with an interactive discussion with the Associate Producer and other leaders in the fashion industry. This event is sponsored by McKesson's Emerging Professional's Employee Resource Group and will include special guests from Nneka by Penelope, Vermuelen & Co. and Dhana. Connect with amazing professionals while you uncover the untold story of the high costs of fashion and how you can make a difference. Limited free admission available with RSVP. Enter and show up for a chance to win! After you register share this event with your friends and tag @gyalsnetwork for your chance to win during our drawing at the end of the night. You must be present to win. Conversations With a Bo$$ Lady - A Fun, empowering dialogue with remarkable women leaders. Gyals Network will convert the beautiful FAME building into an awesome GAME BAR filled with SF’s most diverse group of emerging female leaders. If you're a professional woman, entrepreneur, or just want some #gyalpower fueled inspiration, you don’t want to miss this. Our events are one of a kind featuring FUN facilitated networking and empowering panel discussions that will help you take your career and network to the next level. Connect with amazing professionals while you participate in our #playwithpurpose segment, playing games that bring you back to your inner child! Discounted early-bird tickets are available for $15 in limited quantities. Door tickets may not be available. Hashtag your event photos #gyalsnetwork and #playwithpurpose on social media for your chance to win during our drawing at the end of the night. You must be present to win and your post must be public.